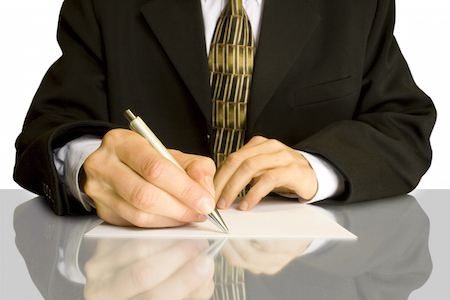 If you want to protect your small business and help prevent business disputes or breach of contracts, it is important to write solid contracts. If you are new business owner, we’ve listed 6 helpful tips below to help get you started with writing business agreements. If you are making any type of business deal, agreement, non-compete/employee agreement, or otherwise, it is crucial to get it in writing. You can’t rely on oral agreements, even though they may sometimes be binding. The reason you should avoid those type of agreements is because they are often difficult to prove or enforce in court. It isn’t necessary to write a contract with words that are “legalese”. If you own a small business, all you need to worry about is using simple language, so that both parties understand what they are signing. You need to be clear with the terms and specific details of what would happen if the contract was breached. In business law, you can never be too cautions. When writing a contract you don’t want to be general or vague. Make sure that there are specific details written out that won’t leave room for interpretation. This will make it easier to defend in court if the agreement is violated. If you want to ensure that your contract is kept confidential, make sure to include this in the contract. Write a clause that binds them from disclosing your trade secrets or other business practices that you don’t want shared. An important aspect that many businesspeople often don’t think of, is using the correct legal names of all parties involved in the agreement. If anything goes wrong, you will want to be sure that you can hold those who are indicated in the agreement responsible. For example, if you’re making a contract with a business be sure to include the name of the corporation whether it is an “LLC” or an “Inc.”, and not the names of those who are signing the contract. If your agreement involves payment, make sure you write about how that should be met whether it is upfront, installments, etc. Other details you may want to include is the type of payment such as cash, credit, or check. Because most contract disputes often deal with money, you will want to make sure that you are as specific and detailed as you can. Agreements are not meant to be infinite. You can choose to include certain details giving permission to end the contract if the other party isn’t making their payments after a certain amount of time. This is beneficial, so that you don’t breach the contract if you aren’t being paid. Of course, we understand that drafting contracts are not always that simple. If you need sound legal advice or representation to resolve a business dispute, we would be more than happy to help.